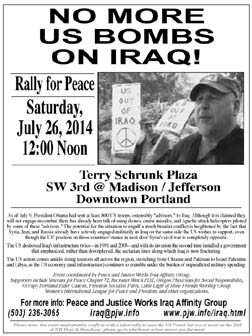 PORTLANDERS SAY "NO MORE US BOMBS ON IRAQ"
At noon on Saturday, July 26, Portland area groups will gather at Terry Schrunk Plaza, SW 3rd and Madison, across from Portland's Federal Building, to raise the cry "No More US Bombs on Iraq." As of July 9, President Obama had sent at least 800 US troops, ostensibly "advisors," to Iraq. Although it is claimed they will not engage in combat, there has already been talk of using drones, cruise missiles, and Apache attack helicopters piloted by some of these "advisors." The potential for the situation to engulf a much broader conflict is heightened by the fact that Syria, Iran, and Russia already have actively engaged militarily in Iraq on the same side the US wishes to support, even though the US' position on those countries' stance in next door Syria's civil war is completely opposite. The US destroyed Iraq's infrastructure twice-- in 1991 and 2003-- and with its invasion the second time installed a government that emphasized, rather than downplayed, the sectarian lines along which Iraq is now fracturing. The US action comes amidst rising tensions all across the region, stretching from Ukraine and Pakistan to Israel/Palestine and Libya, as the US economy (and infrastructure) continues to crumble under the burden of unparalleled military spending. The active Israeli siege on Gaza is made possible by US tax dollars; US troops have been dispatched off the coast of Libya while "advisors" are on their way to Ukraine; drone strikes in Pakistan resumed after a 5-month pause on June 12. The action is being coordinated by the Peace and Justice Works Iraq Affinity Group and is being supported by Veterans for Peace Chapter 72, Recruiter Watch PDX, Oregon Physicians for Social Responsibility, Occupy Portland Elder Caucus, Freedom Socialist Party, Americans United for Palestinian Human Rights, Little Light of Mine Friends Worship Group, Women's International League for Peace and Freedom, Portland Peaceful Response Coalition, American Friends Service Committee, War Resisters League-Portland, Individuals for Justice, Jewish Voice for Peace-Portland and other organizations. For more information or to get involved contact 503-236-3065 or iraq @ pjw.info. "The new injection of manpower brings the total number of U.S. personnel sent to Iraq to deal with the recent crisis to approximately 800." "Iran's official news agency says colonel was killed while defending a Shia Muslim shrine in the city of Samarra."